No, not that Charles, silly. A king may have given his name to Charleston, but it was a Charles of another kind all together who bought a piece of unpromising swamp on the outskirts of town; Charles Edmondson, a wiry Scottish Shetland-Islander. They don’t come much tougher. Temperatures in the Shetlands, in that subarctic windswept place of stark, bass-relief beauty, peak each year at around 59 degrees farenheit, 15 degrees centigrade during the fat days of August. Charles Edmondson was a shipping merchant. He had travelled from Scotland half way across the world to the City of Charleston, South Carolina, to a climate of an entirely different kind, to build a life. And he had an eye on the future, and maybe, just maybe, he could see what was on the cards. For though he had bought soggy land unfit for foundations of any kind, three years after his purchase, the City’s planners built a sea wall. And that changed everything. The land dried out, and was fortified. And before long, it was ready for the foundations of a great house indeed; a house of a very singular kind. He built a Charleston Single House. That Charleston thing: sophisticated, simple, ingenious. A long, thin house, just one room thick, extending in a long narrow line perpendicular to the street. And its crowning glory was the development of vast, three storey porches the length of the building, high and wide to catch the prevailing south winds and waft them into the lavish, but utterly hospitable, reception rooms. A door invariably opened, in a Charleston Single House, from the street into the outdoor piazza. Here was outdoor space reserved for the occupants of the house; a private affair. And when that warm weather arrived, so different from the chilly islands of Charles’s youth, the sea breezes conditioned the heat of the Deep South and made the house habitable. Alas, Edmonton’s financial difficulties forced him to sell up in 1838, to Charles Alston, whose money was in rice. The building was changed from simple regency to Greek revival, and this new Charles added a third storey. Now visitors were received on the capacious first floor with its 14 foot ceilings: and the top floor could be reserved for functions. Everyone was building the Charleston single houses: Charleston, and only Charleston, has such places in it, for they are perfectly adapted to the sublime sea winds on that part of the coast. The piazza was the perfect place to watch strife from afar. General Beauregard, who gave that fatal order to start the cannons bombarding Fort Sumter opposite, stood and watched the whole thing on the porch of the house. General Lee stayed a hasty night there after a fire further into town in the same year, 1861. A furious earthquake in the late 19th century claimed a front porch, and now it stands replaced by sturdy iron. These days, it’s a house museum, and holds the gazes of those walking the East Battery, quite distracting them from the glittering sea and the crazy hunting pelicans which dip and dive, and the distant hazy forms of the forts which protect the harbour. The house has watched America change, at first hand, with a front seat. With heartfelt thanks to Michael Maher, Charleston architect and husband of author Andra Watkins, for a magical tour of Charleston which inspired this post. On his tour, I fell in love with a very similar house to Charles’s. Three storeys, sea view, gorgeous piazza. My photographs today include some of the Edmunston-Alston house, and a few of the house I fell in love with…. Posted in The Charleston ChroniclesTagged America, architecture, Charleston, Charleston Single House, history, piazza, South CarolinaBookmark the permalink. Nothing finer than a porch in the Carolinas. Those Southern wrap-around porches are things of beauty. You can rock back and forth on a sultry afternoon in a porch swing with a book and a glass of iced tea. Heaven. Imagine having a full set of 19th century corsetry and farthingale, Gale! However did Scarlett manage, porch or no? Beautiful architecture. And air conditioned. What a winning combination. Enough to make me want to try dress-up, Virgnia, see what it was really like as a 19th century person sitting on those piazzas. Andra, I laughed out loud. A Deep South kill collection, right next the pool. If that’s not a story waiting to happen, I don’t know what is…. Love these places, the Lovely Miss TK and I took our inbound Youth Exchange student Karla from Peru for a tour of the Battery area this past Sunday and took similar photos. She was fascinated with the gardens behind the wrought iron fences that are tucked away beneath the three story porches. It was a hot day Sunday and the sea breeze was very welcome when we came to a cross street and the air was free to blow right on by us. In old New Orleans, Louisiana, many houses were built this way. One room thick with a side hall connecting all the rooms. This is because property tax was determined by the width of the house not the length or area. A bit like our window tax, Carl, which had people blocking up their windows….amazing what lengths we will go to to avoid the taxman! 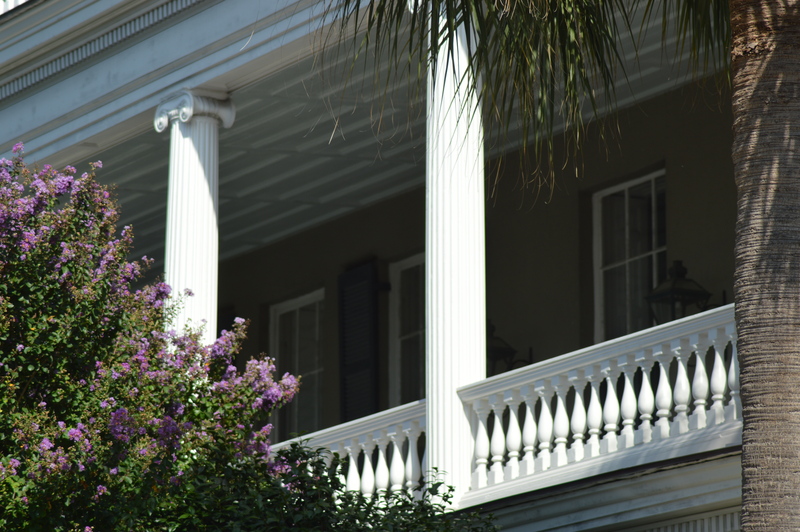 Those porches are perfect for rocking chairs and Mint Juleps. Let me know if you want my recipe. Nancy, please can I have your mint julep recipe? And will it taste the same in English drizzle? I enjoyed Mint Juleps inside Colonial Taverns (in Williamsburg) on rainy days . . . so it should work. It’s a simple drink: Bourbon, Simple Syrup (equal parts water and sugar brought to a boil and cooled), and mint leaves for muddling in the glass. And lots of ice to chill it. Many recipes call for 2 parts bourbon to 1 part simple syrup . . . that sounds strong but the melting ice changes the ratio in short order. I’ll go find my recipe and come back. Simple Syrup: Pour 1/2 cup boiling water over 1/2 cup sugar; stir until sugar dissolves. Stir in 1/4 cup lightly packed fresh mint leaves. Cover; chill at least 4 hours. Strain. Store covered in the fridge. Makes about 3/4 cup ~ enough for 3-6 Mint Juleps. Pour 1 Tbsp. Simple Syrup into tall glass or silver julep cup. For a sweeter cocktail add more Simple Syrup. And 2-4 large sprigs of fresh mint. With the back of a spoon, muddle the mint. Fill the glass with crushed ice. Stir in 1/4 cup (2 oz.) bourbon. Ice will dissolve partially. Add more ice to fill glass to rim, stirring again. Partially tear a sprig of 6 mint leaves to release aroma and insert into ice with leaves on top. Serve with a straw barely taller than the mint leaves. If it’s not sweet enough, stir in a bit more Simple Syrup. Yay! Thanks Nancy! I shall enjoy that, even without the porch. And the warmth. And the sun. In fact, it will brighten a September evening. Ever since this thread, I’ve been dreaming of Mint Juleps. So, today I made some simple syrup and then realized we didn’t have any bourbon. So I used a good dark rum instead ~> more of a mojito than a julep, but stellar in its own way. Equal parts of minted syrup and rum, well stirred with crushed ice, was . . . PERFECT! Nancy, I can feel an evening of Mint Julep experimentation coming on. Thank you. Rum. Got it. Charles, unlike some Northern Hemisphere immigrants to Sydney, adapted well to his new climes, building those wonderful wide verandas. Some old buildings here in Sydney are built for Outer Hebrides weather – brick fortresses with no verandas or porches, whatsoever. My father has talked about those, BB. I wonder if they are cool inside in hot weather? I can’t imagine moving from the Shetlands to Charleston. My mother and I spent a night and a morning in Charleston visiting antique shops before the humidity made it difficult for her to breathe and we had to leave. If we’d been sitting on a veranda, enjoying the breeze, we might have been able to stay longer. It was beautiful. Still, 59 degrees in August sounds wonderful. It does, Kathy, unless you are British. We are so use dot being damp and wet and freezing cold. Socks are very important to us. Some time you must plan an extended stay over here. A rainy British Summer can chill one to the bone. I remember the architecture well. There are still a couple of houses I haven’t yet forgotten, and it’s been about 15 years since we were last in Charleston. I think it’s a charmingly beautiful city, and I didn’t know that much about its founding. How great to have such an excellent and personal tour guide. I am sure Michael was thrilled to have such an eager and interested tourist-friend to engage! Michael, and indeed Andra, were a gift, pure and simple, Debra. People who could not only show the city but interpret it with passion, expertise and insight. Absorbing stuff. I was grinning widely the day Michael and Andra took us round, Penny. I was like a kid in a sweetie shop, as they say over here. Dear Kate, way back in 1971, after finishing graduate school a friend and I took a road trip together through Kentucky and Tennessee, over the Cumberlands, and into South Carolina and thence to Charleston, then up to Winston-Salem and back home to Dayton, Ohio. In Charleston we toured and looked in awe at the lovely homes with their graceful porches and lovely doors. We camped on the beach where we pitched our tent and spent three or four nights listening to the lapping waves . . . and being bitten by fleas! A wonderful time and your posting brought it all back. Thank you. Peace. That must have been a wonderful trip, Dee. Coincidentaly – more thanks to Washington than Charleston – my legs are polka-dotted.